Newspapers are still putting boring headlines on amazing stories like the Jamie Gilt shooting. Why? Mainstream media’s well-documented woes in the Internet era are largely the result of market forces beyond their control. As a former local newspaper reporter, I empathize with their plight. But there are times when it’s hard not to lay at least a little blame for legacy media organizations’ struggles at the feet of the people who edit them. Local news outlets covered the story but missed the point. Some of these headlines are better than others. “4-Year-Old Shoots Mom in Car” is admirably concise. “4-Year-Old Boy Accidentally Shoots His Mom in Putnam County” is a little flabbier, but excusably so: Place is important to a local audience. In contrast, “Woman Tells Putnam County Deputy That Son, 4, Shot Her in Back While She Was Driving” is a disaster of a sentence—in any context, really, but especially in the social media age, when people don’t read your story unless they find the headline compelling. It puts the emphasis on what a woman told a deputy, burying the actual news in a clunky subordinate clause. 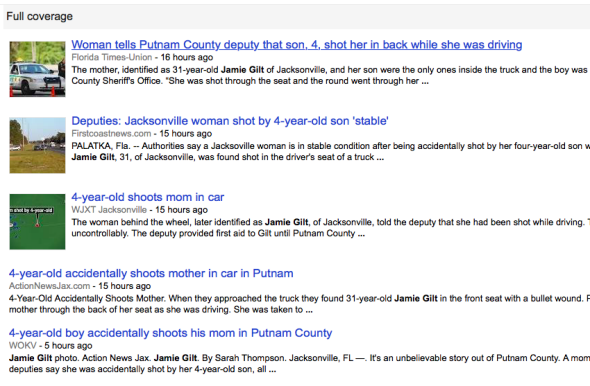 Worse yet is this one: “Deputies: Jacksonville Woman Shot by 4-Year-Old Son ‘Stable.’ ” It’s like the copy desk held a contest to see who could make the most sensational story sound the least interesting. The woman, 31-year-old Jamie Gilt, had a Facebook page titled, “Jamie Gilt for Gun Sense.” (It has since been taken down.) The page was filled with posts downplaying the dangers of guns, including in the hands of children, and mocking those who would prohibit them. Irony rarely comes thicker than this. It transforms the story from a noteworthy local news event into a parable for the ages. Even Snopes.com was moved to confirm the story, presumably in response to a flurry of requests from readers who found it too perfect to be true. Jamie Gilt’s Facebook page, before it was taken down. Yet much of the local coverage failed to draw the connection to Gilt’s pro-gun activism at all. A few outlets included it in the body of their stories, as the sort of incidental detail that belongs somewhere in the middle of the inverted pyramid. And so it fell to the Mail Online—the shameless, sensationalist, ethically dubious, and massively successful website of U.K.-based tabloid the Daily Mail—to find the story within the story, and to bring it to a global audience. And then to reap the rewards of a story gone viral. The Mail Online has a well-deserved reputation for sensationalism. But sometimes a story really is sensational. The Mail is often criticized, rightly, for purveying clickbait of one sort or another. Clickbait is a bad story masquerading as a good one to trick people into reading it. But this is not that. This is a jaw-dropping story—masquerading, in the stone hands of the outlets that first reported it, as a straightforward one. Sometimes the Mail wins by playing fast and loose with the truth, and you could make the case it did some of that here. Calling Gilt a “high-profile gun activist,” for instance, is a stretch: Her Facebook page had less than 1,000 likes. But this story didn’t need that. Other outlets, including Slate, picked it up and found tons of readers for it without embellishing anything. It occurred to me early on that the Mail might have been first to the run with the “gun sense” angle because it didn’t feel the need to confirm that the Gilt who was shot was the same Gilt who had the Facebook page. But if that was what was stopping the local media from emphasizing Gilt’s gun advocacy, it shouldn’t have. My colleague Ben Mathis-Lilley told me he confirmed it independently in a matter of minutes, via a Nexis search that revealed just one Jamie Gilt in Florida public records. By rights, it should have been the local papers whose stories the world was sharing on Wednesday. They found it first, and they did the original reporting. They should have had the viral win. But they didn’t—not because the world is unfair (although it is), but because they were blind to the possibility that a local news story could also be something bigger than that. The Gilt story is but one recent example that happened to catch my eye. Sticking with the theme of gun safety in Florida, the Orlando Sentinel ran a story on Nov. 1 headlined, “Cracker Barrel Shooting Believed to Be Accidental.” Passive voice, awkward construction, emphasis on the wrong predicate (“believed to be”): check, check, check. In this case, the evil traffic opportunist that swooped in and turned the story viral was not the Mail but Mathis-Lilley, whose 103-word Slatest post on the Cracker Barrel fiasco a day later garnered some 15,000 likes and generated 800 comments. Should the Sentinel’s copy desk have given the story a headline as irreverent as “Man Accidentally Shot at Florida Cracker Barrel in Literal, Actual Most American Thing Ever”? Of course not. But it could have done a lot better than it did, and generated a lot more interest for the piece, had it given even cursory thought to how it might be received on social media. And it isn’t just local media that routinely fail to emphasize the most interesting aspect of amazing news stories. National and global legacy media organizations have entire social-media divisions, but still habitually bury the lede in their coverage of ironic, poetic, sensational, illustrative, hilarious, or otherwise extraordinary stories. Remember when the worst terrorist ever managed to spectacularly blow himself up on a Somali plane without harming anyone else? CNN’s headline was bad enough: “Blast Blows Hole in Commercial Plane Over Somalia; 1 Falls and Dies.” The Guardian’s was worse: “Somali Jet Makes Emergency Landing in Mogadishu After Onboard Explosion.” Both were apparently laboring under the mistaken assumption that the role of a headline is to summarize a few relevant facts from a story that people will read regardless. That assumption is a relic of a time when people’s choice of news sources was constrained by the few newspapers or magazines they happened to subscribe to, or the few channels available in their basic cable package. Even then, I’m certain that fascinating stories went unread thanks to dreary headlines. Editors just didn’t have the analytics tools to measure it. It’s understandable that legacy news outlets would need some time to recognize the implications of a digital world of virtually unlimited information. But this is not 2008. It’s 2016, and digital upstarts like BuzzFeed and the Huffington Post have been drinking the mainstream media’s milkshakes for so long that they’ve built media empires of their own. Why, at this incredibly late juncture, have local media still not grasped that their potential audience need not be limited by the bounds of their print circulation area? Why are even the largest news organizations taking their readership and viewership for granted? The answer, I suspect, is not that they’re unintelligent or bad at their jobs. It’s that their businesses aren’t structured in a way that incentivizes reporters and editors to compete for online readership. Local media’s revenues are still driven by local subscribers and local advertisers who want to reach local audiences. The occasional windfall of Web traffic and Facebook shares might temporarily boost their spirits and their programmatic ad revenue, but it wouldn’t make much of a dent in their bottom lines. Meanwhile, they have great incentive to avoid upsetting their loyal readers or advertisers with a headline that could be viewed by some as insensitive or partisan. National and international news organizations, meanwhile, still make the bulk of their money from traditional advertising channels, partly because they still haven’t found a way to make online ads work as well as print ads and TV commercials. And, on an individual level, local reporters and editors like to console themselves by thinking that they’re above the sort of social-media pandering and SEO-baiting upon which the likes of the Mail Online have built their empires. (I speak from personal experience here.) And so they stay in their lanes, even as those lanes continue to shrink, and even as the roads they’re on lead relentlessly downhill. There are real advantages to the old business models, not least of which is that relying on subscribers or loyal viewers rather than unique visitors incentivizes sustained, reliable, and truthful reporting over mindless click-chasing. But just because the Mail Online represents some of the least savory aspects of digital journalism doesn’t mean the rest of us can’t learn from what it does well. Finding the most compelling angle for a given story, and presenting it in a way that will encourage online audiences to read and share it, should be a part of every journalist’s skill set by now. If it were, the Mail and other major news aggregators might find themselves with a lot fewer opportunities to repackage and profit from others’ work. The point is not that mainstream media should stop doing what they do best: original reporting of newsworthy events, with an emphasis on balance and accuracy. It’s that they’ll be able to do more of that if they also embrace and learn to speak the language of the Web and social media. The Union-Leader’s tweet of that photo didn’t detract from its coverage of the campaign stop in any way. It did, however, help to birth a meme. The era in which local media held near-monopolies over news, sports scores, stock quotes, gossip, and classified advertising in their communities is long gone. Let’s hurry up and get to the era in which they fight for, and win, their fair share of the online pie.